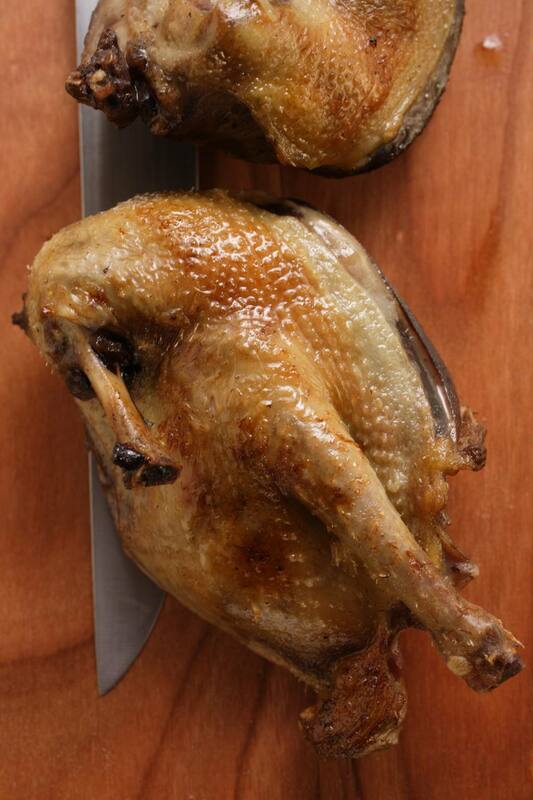 Like all game birds, squab needs to be slightly undercooked so it can be served medium rare. Although the USDA recommends cooking game birds to an internal temperature of 180 F, any harmful bacteria are killed at 145 F. Squab is certainly a special-occasion bird, and this easy recipe makes the most of squab's unique flavor. Beat together 1 stick of butter, shallots, thyme leaves, lemon zest, sea salt and several grinds of freshly ground pepper in a mixing bowl until smooth. Divide into 4 portions. Using a couple of fingers, carefully loosen each squabs skin attached to the breast and legs, then work in 1 portion of the butter mixture, spreading it over the breast meat and in between the legs. Stuff the squab's cavity with a thyme sprig, tie its legs together with kitchen string. Sprinkle the Kosher salt and more pepper over the squab. Repeat with the other squab.